If I were in the habit of giving “best update” awards, the Hoka Clifton 2 would be a solid contender for 2015. It’s not so much that I love the shoe – it’s actually a bit on the soft side for my personal taste. 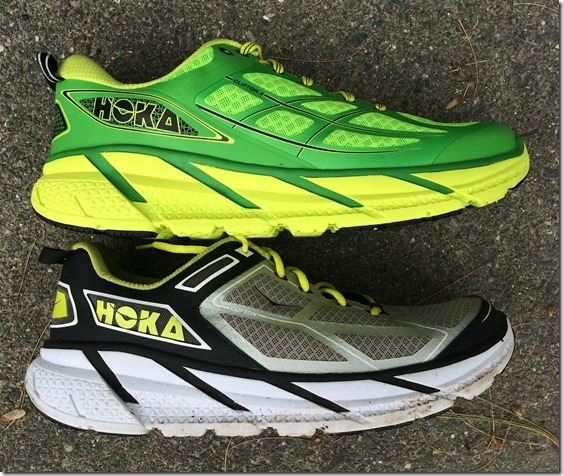 Rather, Hoka did a great job addressing problems that people had with the original version, and didn’t change the things that people liked so much about the shoe. This was a wise choice – Running Warehouse reports that the original Clifton was their top selling shoe in 2014, so messing with success runs the risk of alienating fans of a wildly popular shoe (you can read my review of the original Clifton here). Per Running Warehouse, the Clifton 2 weighs in at 8.7 oz in men’s size 9, and has stack heights of 29 mm heel and 24 mm forefoot. For comparative purposes, Running Warehouse weighs the original Clifton at 7.8 oz, so it has gained about an ounce in v2. Stack heights are the same. To be honest, the Clifton 2 is a pretty minor update from v1. It has a new upper, but the structure of the upper is pretty similar to the original – a breathable mesh with welded overlays for support. The sole is exactly the same as that of the original – same stack height, same outsole, etc. I’ve seen some people comment that the sole feels a bit firmer than the original, others have said the opposite. After my first run I thought they might be a tad more responsive, but after subsequent runs in them I’d say the sole feels identical to the original. If you enjoyed the soft, squishy ride of the Clifton v1, you won’t be disappointed by v2, and that is a good thing for fans of the shoe. 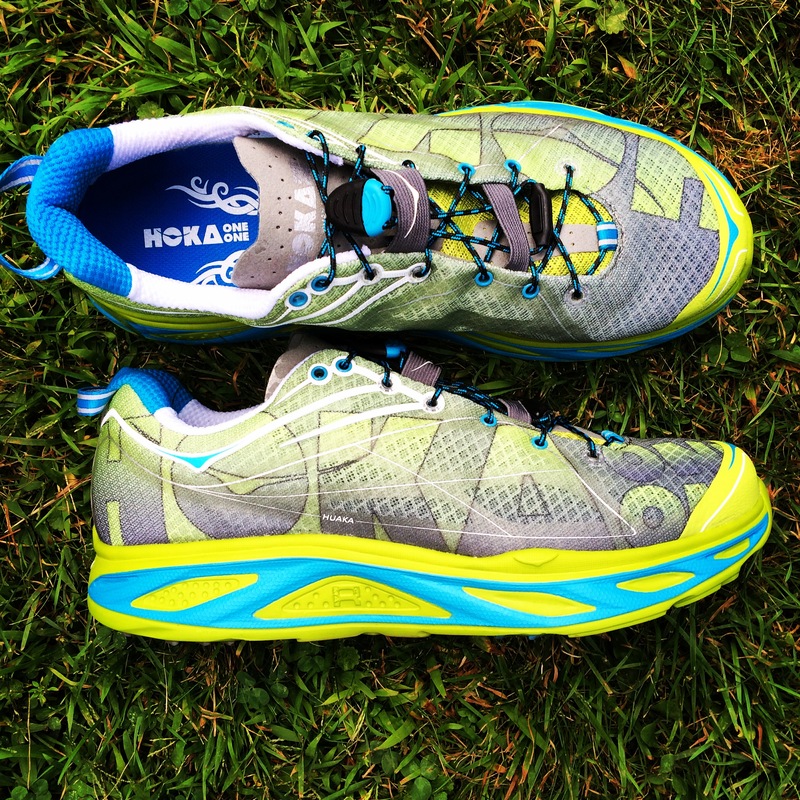 Hoka didn’t tinker with the cushy ride that so many people loved. So what has changed? Well, the biggest complaints I saw about the original Clifton were related to a somewhat sloppy fit, the thin tongue, and a flimsy insole that tended to slide around in the shoe (mine were glued down, so I did not experience this). Hoka responded to all of these complaints in the Clifton 2. First, the tongue in v2 is padded and as a result is much thicker than that of the original. This provides a bit more protection from the laces, allowing you to cinch them down a bit more. 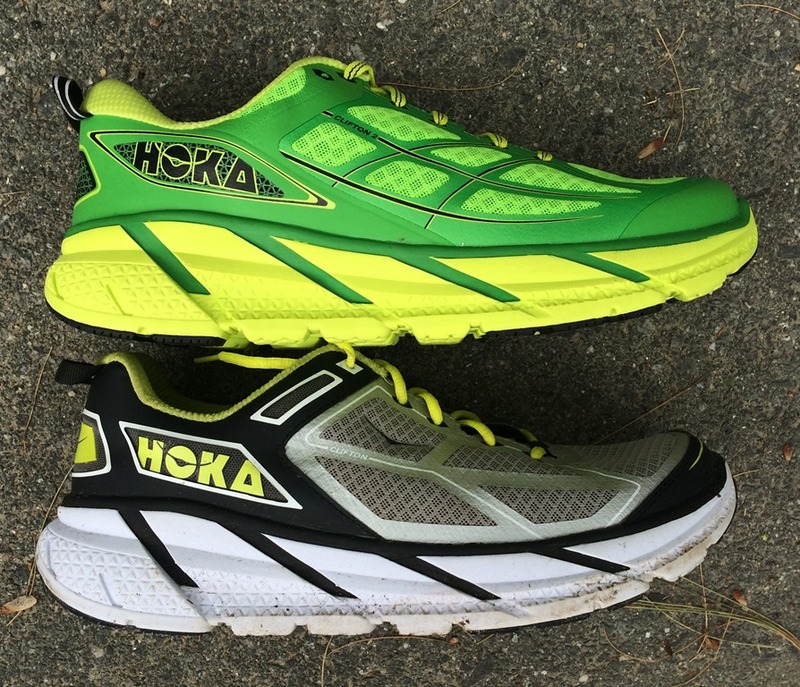 Hoka Clifton 1 (left) and 2 (right). Note the padded tongue in v2. 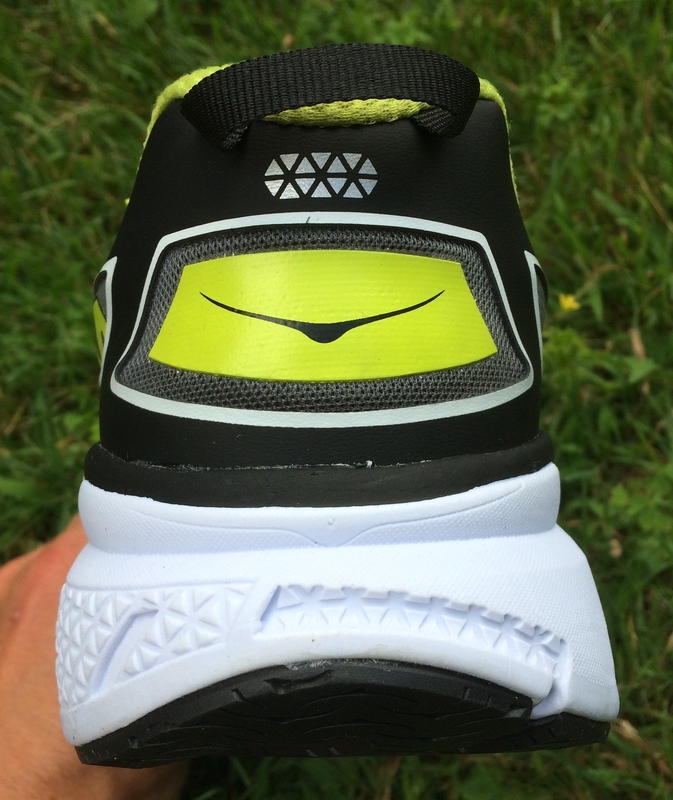 Second, Hoka added an additional lace hole back toward the ankle. I’d heard of people punching their own holes in the original Clifton so that they could better lock down the heel, so this is a positive addition as well. 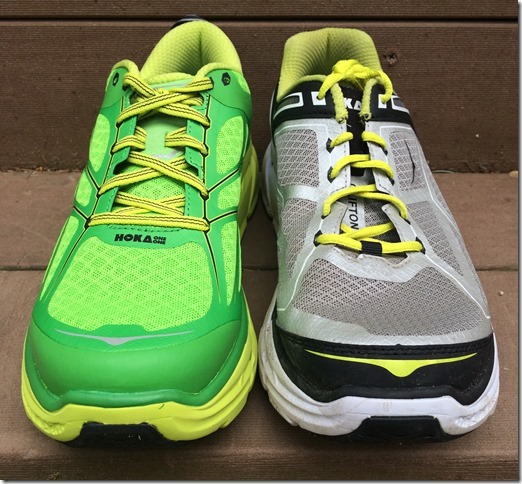 Hoka Clifton 2 (top) and 1 (bottom). Note the extra lace hole (unused in my case) in v2. 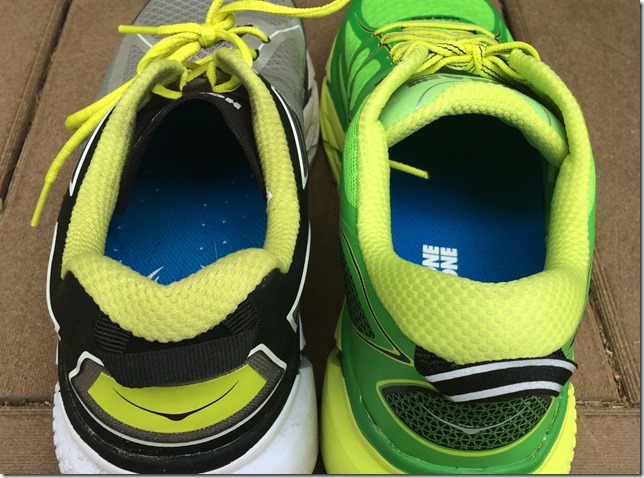 Finally, Hoka added an Ortholite insole – though still thin, it adds a bit more cushion and I have not experienced any sliding or bunching of the insole in v2. All of these changes help provide for a more secure fit, and take care of all of the major complaints about the original. A few comments on fit – the Clifton 2 is an average width shoe in the forefoot. It’s not constricting, but neither is it particularly roomy. I actually think this is ideal for a Hoka since a roomy forefoot with a soft Hoka sole would tend to encourage a lot of sliding around inside the shoe (as I experienced with the Skechers GoRun Ultra). In this shoe I feel very secure, and they even responded well on a few miles of very uneven trail yesterday. As for length, I went a half size up in the Clifton 2, same as I did in the original. I think this was the right choice. 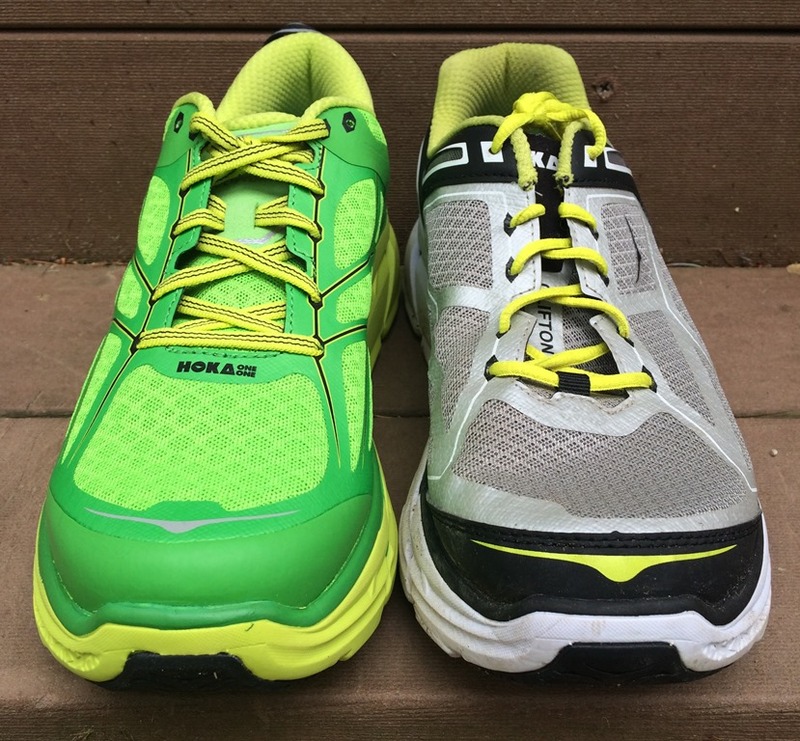 Hoka Clifton 2 (left) and 1 (right). I’ve run about 25 miles in the Clifton 2 and have actually enjoyed them more than I enjoyed running in v1. As I mentioned, the shoe is a bit on the soft side for my taste, but the cushy sole has been working for me this time around for some reason (maybe because I gained a few pounds over the winter?). I still wouldn’t choose the Clifton as an everyday trainer, but for easy runs and recovery days they feel pretty good. Hoka was wise in keeping the ride the same, and changing only those things that needed a fix. If you loved the original, and a lot of people did, I think you’ll be very pleased with the update. The Hoka Clifton 2 is available for purchase in the US from Running Warehouse and Hoka.com. It is not yet available at Running Warehouse EU. Thanks for this, Pete. My biggest gripe about the first version was the upper’s impinging on my little toes. The last curved inward in that area too soon. The length was fine so I didn’t want to go up a half size. Can you say if there is any more room in the outer forefoot in the new version? Mark–I’ll tell you that I don’t think this is better on that score. I was a recent convert to the Clifton (1s) and have a wide foot across the toes, so I was very concerned when I read the new Clifton (2s) might be narrower/firmer. I did my first 6 miler yesterday and while I’m not sure it’s any worse, it’s certainly not better. Pete’s point about firming it up to avoid the “squishiness” is valid. It’ll take me a few longer and harder runs to really determine the answer–but if your little toes were at risk on the 1s, they are also at risk on the 2s. Overall though, it feels good underfoot and Pete’s point about the sliding insole is a major improvement, as is the tongue. Yes, agree on fit, feels the same to me. I did go up a half size in both v1 and v2 so have not experienced any toe squeezing. I agree with Doug in that I believe the little toes still rub against the shoe, and going up a half size will allow too much over-all foot movement. Further, I believe the 2 is a bit clunkier and the ride is more like wearing a typical training ride vs. the more efficient and smooth ride of the Clifton 1. 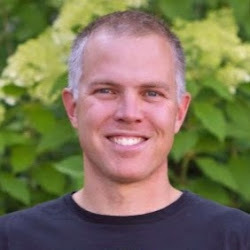 Pete – I would generally agree with your comments regarding the Clifton 2. My initial thought, though, is that the shoe is just slightly firmer than version 1 (I have had three pairs of Version 1). I don’t think the upper is any roomier than Version 1. One positive change you don’t mention is that Hoka has switched the laces to a stretchier material that stays tied without double-knotting — that was a big beef of mine with Version 1 — unless I double-knotted the laces, they came untied regardless of whether I was running or walking. Thanks Trey, I definitely though on my first run that they might be a tad firmer, but maybe a short break in did away with that sensation? I’m not sure. IT’s a subtle difference if there is one. Good call on the laces, I didn’t even notice since I’m a double knotter. good to hear that i wasn’t the only one who had to glue down their insole. after 1/2 my runs, it would end up flapping out the back of the shoe…too bad i just bought a new pair of v1 about a week before v2 arrived. thanks for the update. Am I the only runner who actually went down a 1/2 size in the Clifton? True to size gives me the right length, but a toe box that is a bit too roomy, which translates to a poor response when running. A 1/2 size smaller gives me a very responsive, snug fit around the foot, but leaves my toes a bit cramped. This is a terrible update. The highly padded upper causes heel hot spots. The build quality is dismal – the upper overlays started de-laminating after the first run. The added weight doesn’t help either. Sent mine back to get the original while they were still available. 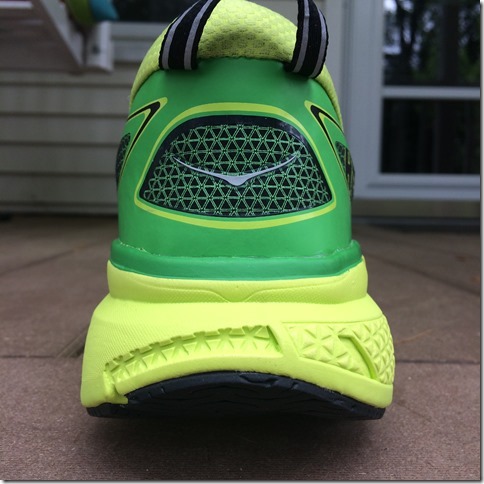 I am a huge Hoka fan and I still think the Clifton 1 is the best shoe out there. I was excited to get the new Clifton 2s and I have about 30 miles on them. I am sorry to say that I am not a fan. They are too constrictive. They do not feel like the original Cliftons at all. They feel more like the Odysseys or the Valors. I actually just found the Clifton 1s on sale and bought three pairs. Too bad Hoka ruined a good thing with the Clifton 2s. I think adding the additional overlays and thicker tongue resulted in a tighter fitting shoe that is too snug for me. I hope Hoka reads these comments, Frank. I agree whole-heartedly. I just bought the Hoka 2’s and will be sending them back. Totally different feel and fit…and not for the better. Contacted Hoka about it as I have exactly the same issues.They acknowledged they have received a lot of feedback saying the same thing and have rectified it in the Clifton 3’s,available in July! I have run about 42km over the last week (longest run was 16km) in these (I was about 2 buy V1 and found out on the day V2 was coming so I decided to wait). I moved from Sketchers Go Run Ultras to the Cliftons. Sketchers were softer but I decided softer wasn’t necessarily better. I think my feet have been in better shape with these being slightly firmer. I have been constantly searching for the world’s softest shoe which is not necessarily the best thing for your feet. I also found the Cliftons more zippy then the sketchersOnly real issue is getting a blister on outside of big toe. Update. I have about 400km on the C2s. Ran my latest HM (3rd in the C2s). Pulled up quite sore. They seem to have taken quite a bit of wear and when compared to a new pair they look like they have taken a beating. It actually seems consistent with my other shoes that they start getting worn out in the EVA at this point (I am under 60kgs!). Might try Adidas boost! Great review…exactly what I wanted to hear. I’m a massive fan of the V1 Clifton and am on my 2nd pair. Honestly, none of the “fixes” for V2 apply to me – I like the thin tongue (I use elastic Easy Laces – which are amazing – so I don’t have cinching/tying problems), I don’t need any more lace holes, and I don’t have an insole issue either. So knowing nothing else really changed, I’ll save the extra oz! I had to size up a half size in both the old and new Clifton. I tried my regular size in the 2 (9.5), but the tips of my toes on the right foot were not happy. The inside toe bumper feels a lot more rigid on the 2 compared to the original Clifton. Maybe they just need time to break in a bit? The new version feels narrower, but it’s probably just that my original Clifton has stretched a lot over the 500+ miles I’ve logged in them. Looking forward to racking up some good miles in the 2s to see how they develop. So far, so-so. I have two pairs of the women’s Clifton V1 and love them. I have already ordered a version of the V2 after reading this review. My main gripe is the pangs of envy I always have for the men’s colors in neutral blacks, whites and greys, of which the V2 has three versions, yet none for women. (They had a light lavender in the V1 that appeared almost white, but that is no longer an option.) When-oh-when will Hoka catch up with Adidas and Nike in letting women have a choice other than neon pink, purple and yellow? I am tired of having to look like I am running in popsicles. I feel the same exact way about the color options! 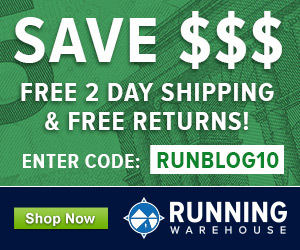 I don’t know how accurate this is, but I saw that runningshoes.com will have Clifton 2s in black/graphite (yes!!!!!) and another subdued cool grey with a neon pink in Jan2016. I need a new pair like yesterday but also really want to see if that black comes out! Great review, I was curious how others felt about these and it seems I may be alone in not liking the update. I feel like the new version is much stiffer and narrower, which is a bummer because I have a wide foot. I thought I’d found my forever shoe, but alas the Clifton 2 is getting returned. Paulette, I agree with you. See my review above. The additional overlays and padded tongue change everything–in my opinion–about the shoe. I do not get the same feel on the return and they feel like a totally different shoe than the Clifton 1. I found the 2 to have a narrow toe box and not work for me. 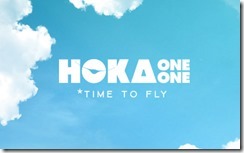 I found an original 1 on line….hoka says they are considering wide widths.in some models. I posted on 6/15 after running in them for a week, and 6 weeks later, with them as my primary shoe, I have perhaps a slightly more nuanced response. On the plus side, overall, it’s probably the best shoe I’ve ever run in for training runs of under 10 miles. On longer runs, I do feel that the “chafing” issue around my toes, due to slightly narrower toe box, are indeed there. I still alternate with my Clifton 1s (and Asics Nimbus which feel like anvils by comparison) and they are definitely “clunkier”–but the wider toe box is worth it on the longer runs for me. Hoka ruined a good thing with the 2 update. Toebox super cramped along with mid foot. Boo! Extra volume in the shoe is gone with this update. As an owner of 4 pairs of the 1’s I will have to find a replacement brand once my last pair of 1’/s are done. So…got the V2s now and have some decent mileage down…this, after going through 2 pairs of V1s over the past year and a half or so. I have to say, I don’t find much difference at all in the toe box. I think everyone needs to remember that ALL Hokas have narrower toe boxes compared to other brands. If you think these V2s are bad, try the Stinsons. Also, like the V1s, I find the upper breaks in after a while and the shoe gets roomier. As for feel, I think they have the same ride the Clifton has always had. I’m don’t feel much difference there either. This to me is a good thing. I don’t notice the extra weight and the build quality seems to be better than the V1s (I found the uppers on the V1 got pretty beaten up looking after a short while). All in all – for me, the V1s were my favourite shoe ever and the V2s are a perfectly good update. Maybe Hoka has a quality control problem, as my 2s are definitely wider than my 1s (which pinched my pinky toes, whereas the 2s do not). Nevertheless, the 2s are completely different. Not as soft, heavier, and slower. There’s just nothing special about the 2s. Much prefer the 1s, even with the pinky pinching problem. Quick question: Has anyone else had ITB issues once switching to this shoe? I’ve never had IT issue, and now, for the first time, I do. I’m wondering whether the forced midfoot-strike is causing it. As I happen to have the Clifton 1s I cannot help but laugh my head off with regard to the photos of the outsoles. Particularly photo number 5 looks like a negative. Things going outside and inside literally are reversed. I ran about 100 miles in the clifton1 and about 125 so far in the 2’s. Here are the differences: the 1 is lighter and more squishy (not even close, the 2 is much more firm). The lateral support feels better in the 2. I had IT band issues running in the 1’s and none of that in the two’s. Both still have a snug fit. The two’s are a little more snug though. the toe box–just barely fits for me and my feet are not wide and my pinky toe gets squashed a bit. I think if your foot tends to run on the wider side these shoes might be uncomfortable without skipping the toe holes with your laces? I double sock–opting for slightly larger than slightly smaller. the tongue is a HUGE upgrade in the 2. Overall i still love Hoka products but you definitely need to try them on before ordering over the internet as they fit differently. THANKS FOR THE REVIEW! I have logged 1000+ in the original and just now have got to log a hundred in the 2 including a 26 mile training run. 2 things stand out. Hoka’s quality control is lacking. I have 2 pair of 2s and they feel different, one rubs my toe from the sloppy tongue where the other does not. Hoka also has taken away the best parts of the 1. They added weight and that cushy tongue. They also added in thick insoles. The 1 was a masterpiece of modern running shoe. The 2 is just another overweight trainer. The Hoka Clifton1 was a masterpiece. The 2’s padded tongue is useless and the extra weight is detrimental. Although the 2 is not a lousy shoe, it is an significant step in the wrong direction. 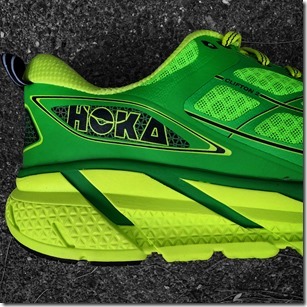 I wrote to Hoka to ask them to go back to the Clifton 1 design. Hopefully, they will listen. I could not agree more with your review. Thankfully, I still have two pairs of the Clifton 2s still in the box that I have not used yet. I have about 300 miles on my current pair. I have been rotating with the Bondi 4s, which are awesome for long runs (over 15 miles). I am going to buy a couple more pairs of the Bondi 4s just in case Hoka changes those too. I’d have to say that after several hundred miles on two pairs of Clifton 1’s, I was very disappointed with the 2’s. I had sized down for the 1’s. Loved the fit, although I did always use both inserts, since I have bony feet. In the 2’s, I got blisters on both feet about two inches from the back of the heel on the inside. Never got blisters from my 1’s. The toe box is definitely smaller, too. Should have sized back up, but I was too unhappy with the rest of the update and sold them after two runs. Maybe this poor fit mostly affects women. I’ve only found one woman who has liked the 2’s. They really screwed up a magnificent shoe. The 1 was the best shoe I’ve ever worn in 39 years of running, an engineering marvel. Debbie Voiles, I am having the same issues as you. Ive run in these shoes 3 times and I also have gotten blisters on the back of my heels. This is very annoying. Other than not knowing what to do to solve this I do like the shoes. Anyone have any advice?